Notes: White Moss Level Crossing Halt was situated on the Lancashire & Yorkshire Railway (LYR) Rainford Junction and Ormskirk line which had opened as a through route on 1 March 1858. When the line opened to passengers there was only one intermediate station and that was at Skelmersdale (originally called Blaguegate). The line made an end on connection with the St Helens and Rainford Junction railway at Rainford which allowed for through running. The St Helens line had been opened by the St Helens Canal & Railway Company but passed to the London & North Western Railway (LNWR) in 1864. Passenger services however ran into Rainford Junction station which was located on the Liverpool and Wigan line. At Rainford Junction there were timetabled connections to and from St Helens as well as the travel opportunities offered by the main line. Sometime before 1865 a branch was opened from White Moss Lane to White Moss Colliery. The branch ran east from White Moss Lane and had connections to the main line running north and south which formed a triangle. 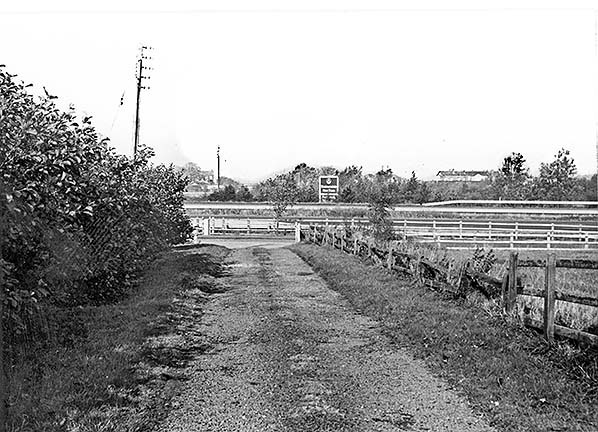 White Moss Lane had two level crossing one of which carried the main line over the road and the other slightly to the east which carried the south to east spur of the colliery line. When the line had opened it was a single track railway but during 1875 it was doubled. A number of new signal boxes were provided including at White Moss Crossing. A 16 lever box (12 active levers and 4 spare) was provided to control the junction and the main line level crossing. I was located on the north side of the crossing on the east side of the line. The new boxes were inspected on 22 October 1875 but were found to be incomplete. It is likely though that they would have been fully operational within a few weeks. In 1907 a railmotor service using Hughes Railmotor's and trailer carriages was introduced onto the Ormskirk and Rainford Junction service and a halt was opened at White Moss Level Crossing to serve it (a halt had been opened on 1 July 1906 north of Skelmersdale at Westhead and another was opened to the south of White Moss at Hey's Crossing in September 1911). The halt was located on the south side of the level crossing and would have consisted of only short low level platforms. With the introduction of the railmotor the passenger service between Ormskirk and Rainford Junction was intensified and there were 19 trains in each direction Monday-to-Saturday. As with the services prior to the introduction of the railmotor there were connections with St Helens services at Rainford Junction. In January 1922 the LYR merged with the LNWR and the July 1922 timetable showed 17 up and 16 down services Monday-to-Friday. There was an extra down service on Saturdays and there were 10 trains in each direction on Sundays. On Sundays there were only 3 trains in each direction on the St Helens line but they did connect with the Ormskirk service. On 1 January 1923 White Moss Level Crossing Halt became part of the London Midland & Scottish Railway (LMS). The White Moss Colliery closed on 31 May 1927 and the branch would have been lifted within a few years. It had certainly disappeared from maps by the 1930s. The passenger service was reduced during the Second World War. On 15 October 1944 the signal box at White Moss Crossing was closed and was replaced by a single lever ground frame which controlled the crossing. At the end of hostilities the passenger service did not recover to its pre-war levels the LMS summer timetable for 1947 showed 13 trains in each direction Monday-to-Saturday. On Sundays there were 7 up and 8 down services which was quite generous for that era. There were no trains from Rainford Junction to St Helens though. On 1 January 1948 White Moss Crossing Halt became part of British Railways [London Midland Region] (BR[LMR]). Service levels did not alter under the new owners but on 18 June 1951 BR[LMR] withdrew the passenger service between St Helens and Rainford Junction. They closed all of the intermediate stations on that line and all of the halts on the Rainford Junction - Ormskirk line. Consisting of very basic facilities White Moss Crossing Halt would have quickly disappeared from the landscape after closure. Passenger services continued to run between Ormskirk and Rainford Junction serving only Skelmersdale as an intermediate station until they were withdrawn completely on 5 November 1956. The line remained open for freight services until 16 September 1961 when the section between White Moss Crossing and Bushey Junction was closed. Goods services continued to run between Ormskirk and the north side of White Moss Crossing until Monday 4 November 1963. On 21 September 1964 trains began running once again. They were track lifting trains and the section of line through White Moss rossing Halt (between Bushey Lane Junction and Skelmersdale) had been taken up by 2 November 1964. The site of White Moss Level Crossing Halt was later lost under the course of the M58 motorway. See Also stations on the St Helens - Rainford Junction line: St. Helens 3rd, Gerards Bridge, Moss Bank, Crank, Old Mill Lane, Rookery 1st, Rookery 2nd, Rainford Village & Rainford Junction. Looking north towards the site of White Moss Crossing Halt in October 1982. 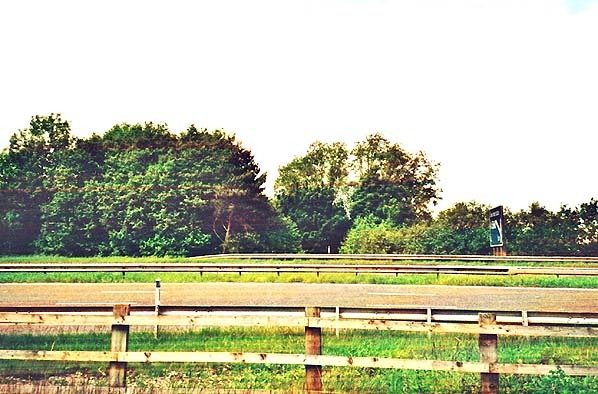 The halt site is beneath the M58 motorway which can be seen running left to right. White Cross Level Crossing Halt shown on a 1:2,500 scale map from 1926. The halt is on the south side of the level crossing. To the east can be seen the White Moss Colliery branch. A signal box diagram for White Cross Level Crossing dating from the 1915-19 period. The White Cross Level Crossing Halt is shown on the diagram. White Cross Level Crossing Halt shown on a six-inch scale map from 1926. The signal box which controlled the junctions is seen to the north of the crossing. The site of White Cross Level Crossing Halt seen on a 1:2,500 scale map from 1960. The course of the White Moss Colliery branch can be seen but the signal box that had controlled it had gone. 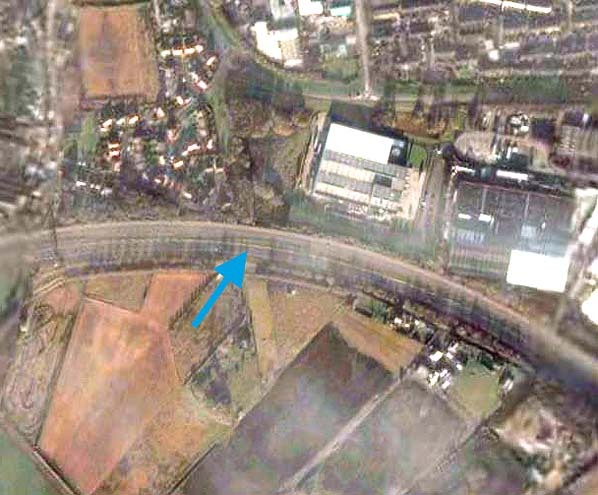 The arrow indicates the site of White Cross Level Crossing Halt the site of which lies under the M58 motorway. The site of White Cross Level Crossing Halt looking north in 2006.